The Achatina (ah-kah-tee-na) is a species of Invertebrate in ARK: Survival Evolved. Found mostly in marshes and jungles, Achatina limusegnis is a very slow, very non-threatening land mollusk. It might be the simplest creature on the Island to hunt, and while it only provides a small amount of meat and chitin, an easy meal is always of value on the Island. 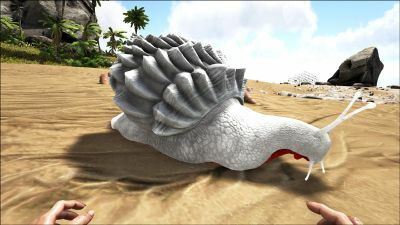 Unlike nearly every other creature on the Island, Achatina does not defecate normally. Instead, it secretes a thick, sticky substance. Achatina leaves trails of this slime, but the trails are so thin that they crumble to dust quickly. There is a very disgusting, but useful fact about Achatina that causes tribes to seek to tame them: its secretions are chemically similar to the "Cementing Paste" and "Organic Polymer" used by many tribes for building materials. Tamed Achatina naturally accumulates this slime over time, which can then be collected at the tribe's convenience. Legend has it that Achatina can be tamed with a special "cake" made from harvested crops & resources. Achatina is one of the few truly docile creatures on the Island. Achatina has all of the features typical of any other genus of snail, with the notable exception of its remarkable size. The shells are very ornate with streaks of bright color and sharp ridges that provide protection from the island's predators; the rest of its soft body is also typically characterized by vibrant or earthy coloration. This section displays the Achatina's natural colors and regions. For demonstration, the regions below are colored red over an albino Achatina. The colored squares shown underneath each region's description are the colors that the Achatina will randomly spawn with to provide an overall range of its natural color scheme. Hover your cursor over a color to display its name and ID. 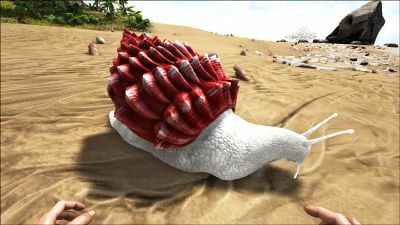 For example, "cheat SetTargetDinoColor 0 6" would color the Achatina's "body" magenta. 5The Achatina is incapable of drowning. Since damage is significantly reduced by the shell, it is best to hit it on the soft, fleshy parts instead. If it takes enough damage, it will retreat into its shell, making it very easy to kill it before the torpor from tranquillizers can knock it out. Be mindful of how bloody the Achatina gets, and use Shocking Tranquilizer Darts or normal Tranquilizer Darts to minimize this risk. Lettuce does not work on P+ for taming! A tamed Achatina will only eat Sweet Vegetable Cake, so it is advised to not tame an Achatina unless one has a steady supply of Sap, Giant Bee Honey, and Advanced Crops for making cakes. Note that all Stacks of Cake will go onto a 30-second cooldown after consumption during which the game will temporarily think there is no food in inventory. This section describes how to fight against the Achatina. Shortly after being engaged, the Achatina will retreat into its shell: it will neither flee nor fight back. Damage dealt to the Achatina will be heavily reduced for as long as it is inside of its shell. Although the Achatina itself is not dangerous, its surroundings are usually filled with predators or alpha predators. Clear the area of hostile creatures before attempting to tame or pick it it up with a flying mount. An Argentavis can carry two Achatina at once when using its claws and beak. Any weapon or creature will be able to kill an Achatina, although fists are ill-advised as you may kill yourself with recoil damage before killing the Achatina. Wild Achatina appear to take damage over time if not in or near a body of water. Domesticated ones, however, do not appear to have this weakness. Achatina - wild and domesticated - do not fight back when attacked. Provides a Spoil Multiplier of 3x for Organic Polymer and Corrupted Nodule within its inventory (90 minutes). As they can be carried, similar to a Dodo, Achatina can be carried while hunting creatures such as Kairuku to extend the lifespan of the Organic Polymer harvested. While Wander is enabled, the Achatina will passively produce both Organic Polymer and Achatina Paste in its inventory. Passively produces 1 Achatina Paste per minute within its inventory, up to 100. Passively produces 1 Organic Polymer every 60 minutes, up to 100. Due to the spoil timer, the first in a chain of three will spoil as the third is produced, making the effective rate 2 Organic Polymer every 90 minutes. Likewise, due to multiple stacks spoiling concurrently, an Achatina will obtain 12 Organic Polymer after 1080 minutes and then alternate between 11 and 12 thereafter. Wild and Tamed Achatina will also passively produce Achatina Paste on the ground instead of feces. Paste dropped this way has a short despawn timer and must be manually collected. Tamed Achatina do not need to be on wander for this, but the paste will spawn underneath them if they aren't, so the player must pick up the Achatina or use a Whip to collect it. 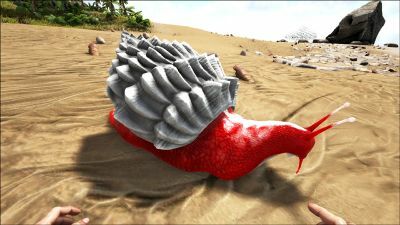 The Achatina is unable to climb over a railing, but can still glitch through it whilst wandering. If it is filled with stone, it does not adversely affect resource production but does prevent them from moving and thus escaping their pens. It's best to simply put them into a Wooden Cage (just like what can be done with the Dung Beetle) and have them on wander; they can not phase through the cage and the cage is easily movable to your preferred location for the Achatina. Achatina is part of a genus of snails that still exists to this day, although none have ever been as big as the dossier shows. It is part of a genus of air-breathing, tropical land snails, terrestrial pulmonate gastropod mollusks in the family Achatinidae. 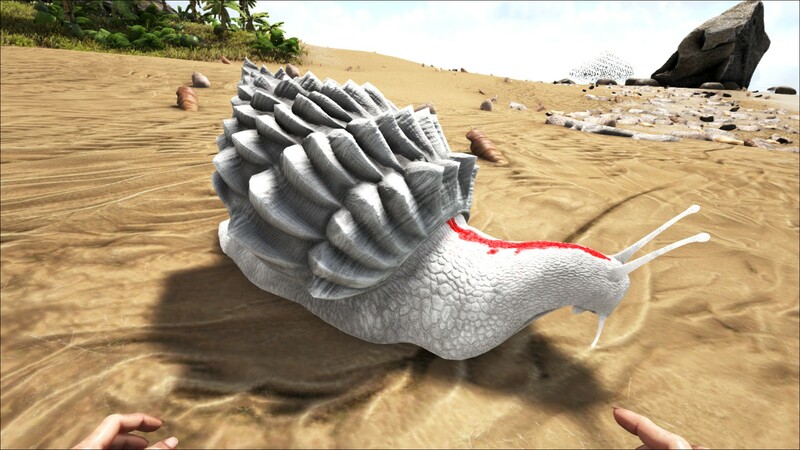 ↑ (07/15/15) Introducing the Achatina, Development Spotlight & ARK Digest #10! This page was last edited on 14 April 2019, at 16:17.